NOW A NETFLIX ORIGINAL SERIESViolet, Klaus, and Sunny Baudelaire are intelligent children. They are charming, and resourceful, and have pleasant facial features. Unfortunately, they are exceptionally unlucky.In the first two books alone, the three youngsters encounter a greedy an... read full description below. NOW A NETFLIX ORIGINAL SERIESViolet, Klaus, and Sunny Baudelaire are intelligent children. They are charming, and resourceful, and have pleasant facial features. 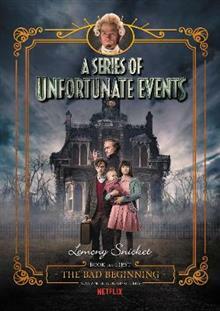 Unfortunately, they are exceptionally unlucky.In the first two books alone, the three youngsters encounter a greedy and repulsive villain, itchy clothing, a disastrous fire, a plot to steal their fortune, a lumpy bed, a deadly serpent, a large brass reading lamp, a long knife, and a terrible odor.In the tradition of great storytellers, from Dickens to Dahl, comes an exquisitely dark comedy that is both literary and irreverent, hilarious and deftly crafted. Never before has a tale of three likeable and unfortunate children been quite so enchanting, or quite so uproariously unhappy.